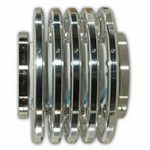 Acceleration Tubes - National Electrostatics Corp.
NEC’s all metal and ceramic acceleration tube assemblies are ideal for applications that require ultra high vacuum capability in regions of high voltage or where a complete insulating barrier is required. 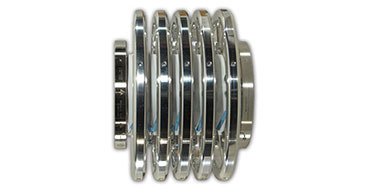 All NEC acceleration tubes are insensitive to thermal shock and exhibit exceptional mechanical strength. They have been in use on a routine basis in very strenuous conditions for periods of over 40 years with no signs of degradation. 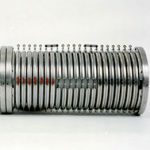 The general purpose (GP) acceleration tube section is designed for operation in clean, dry ambient air and is in use on all NEC open-air ion beam systems up to 500kV. Each GP tube section is made from all metal and ceramic using a standard braze, with no organic compounds in the vacuum volume. This tube is fully bakeable up to 500° C for contaminant free and ultra high vacuum operation. Each section is conservatively rated at 75kV, and multiple sections can be combined to achieve higher voltage. The exterior field is defined by demountable potential distribution rings. Potential grading is provided by ten 150 Mohm resistors in series. A non-magnetic version of the General Purpose Acceleration Tube is also available for the acceleration of low energy electron beams that are adversely affected by proximity of ferromagnetic materials. The high gradient (HG) acceleration tube section is designed for operation in high pressure SF6 gas. These tubes have been used in Pelletron accelerators ranging from below 1MV to above 25MV terminal potentials. Like the general purpose tube, the high gradient tube is a metal and ceramic bonded assembly with no organic compounds in the vacuum volume, fully bakeable for contaminant free and ultra high vacuum operation. However, while the GP tube is manufactured using a standard metal to ceramic braze, the HG tube is manufactured using a unique metal diffusion bond developed by NEC to withstand higher voltage environments. The HG tube is fully bakeable up to 200° C.
These tubes are offered in several standard lengths, depending on the number of gaps. 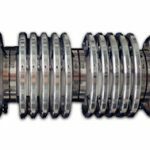 Each gap of the standard HG tube is rated at a conservative 30kV when used in Pelletron accelerators. 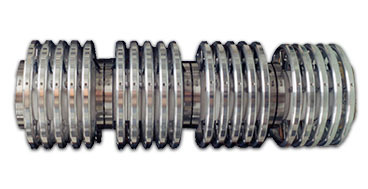 Typical tubes are 20 to 22 gaps long, for a combined voltage rating of up to 500kV. Like the GP tube, multiple HG tubes can be combined to achieve higher voltage. For use in Pelletron accelerators, potential grading is usually provided with a point to plane corona distribution system or resistor divider. The HG tube is available with two diameter configurations, the standard size with an inner diameter of 4.0″ and a larger version with an I.D. of 5.63″. 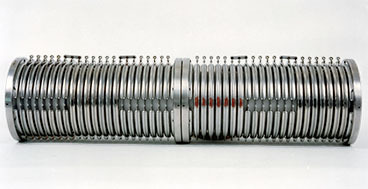 The larger version was originally designed to replace original tubes in Dynamitron accelerators produced by IBA Industrial (formerly Radiation Dynamics). Over the years, the use of these tubes has expanded to many different accelerators around the world to handle larger diameter ion beams. The large version is rated at a conservative 16kV per gap.